I've been writing, but I don't think my insights about learning that chapter three should be chapter one are as interesting as these photos. Woman at Russell Market. We stopped here on the day we took a cooking class with the hotel chef. I can now make about six different Indian dishes! 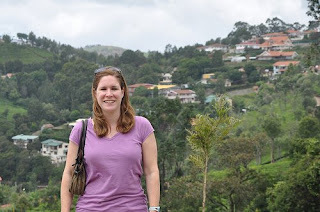 Visiting Ooty, the highest point in southern India. The road winds through a beautiful, mountainous area filled with crazy hairpin turns. 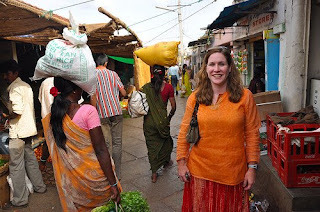 At a market in Mysore, where I bought perfume for two dollars from an eight year old boy who told me the scent was just like Calvin Klein's Eternity. Another bookstore! 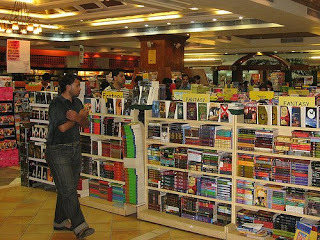 This is the Landmark bookstore (that also sells jewelery and luggage) in Bangalore's Forum Mall. India is full of contradictions. It's old world and modern. Luxuriously rich and poop in the street poor. Hard to break into and full of heartwarming hospitality. It's been an enriching trip. 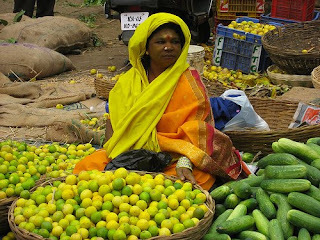 I LOVE the photo of the woman with the yellow scarf sitting in front of the limes. Glad you enjoyed yourself and I hope you filed away a lot of writing inspiration. Karen, glad you enjoyed the photo. The colors in India were so vibrant. I collected so much material to draw on in future writing! I love to write, read, cook, travel and sometimes go to the gym. I live in Chicago but one day hope to live where it’s summer all the time. I’m currently writing my second novel. I offer this online Fiction City as a place for writers to hang out and chat about the business of creative writing.